Within the four principalities “pat a Phangampong” is a total of 43 Ingud communities with rulers Sultans, classified into 15 phagawidan “supported” or Panoroganans Royal houses and 28 phagawid “supporting” or legislative houses called Piyacambaya ko Taritib (decider of Laws) This socio-political system is based on the Taritib, laws, Ijma, customary laws, and adapt, practices of the Maranaos, The Taritib, an ancient order or law bound together the four states or principality of Lanao into an alliance or confederation and define their relationships. There is no central, all powerful authority but every state or principality respected the traditional alliance made by our ancestors termed Kangiginawai. There are two categories of principalities found in the pat a Phangampong ko Ranao. 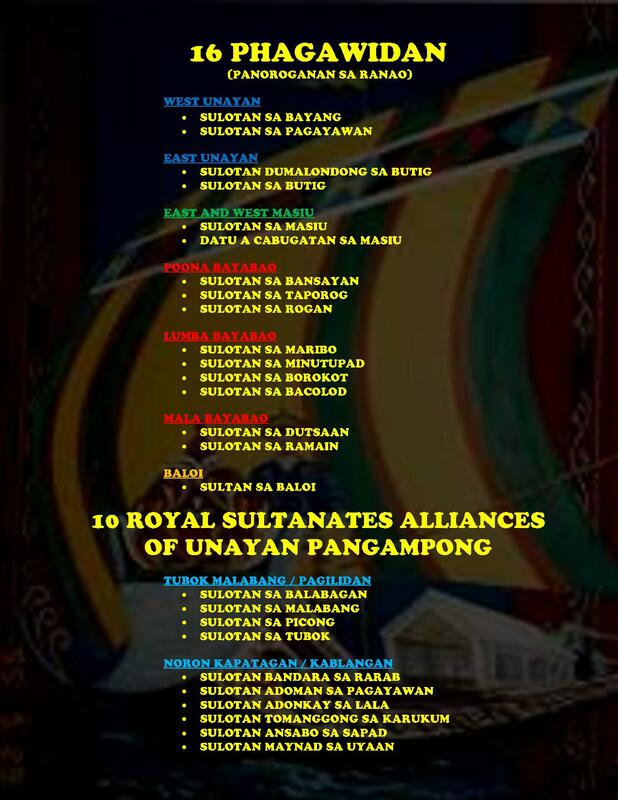 The first category known as Phagawidan “supported” consists of 15 sultanates, now 16 sultanates and are also known as Panoroganan sa Ranao, “to whom one bows” or “one who is revered.” These Phagawidan are distributed further in the four big principalities. The second category known as the Phagawid “supporting” consists of about 28 sultanates known as mbabaya ko Taritib are also further distributed. In addition to the two categories, more than 40 sub sultanates in Ranao known as phagawid ko “Taritib” kadatu sa Ranao. These categories are entitled to approve or disapprove the Taritib, Ijmas (laws) and Adats in their respective Phangampong. Both the Phagawidan and Phagawid sultanates descended from a royal line. However, while the Phagawidan descended from male line, the Phagawid descended from the female line, wata sa mama and wata sa babae respectively. These arrangements agreed during the creation of Taritib in Ranao. Dr. Mamitua Saber claims that as result of frequent intermarriages between the two categories, there is no individual or group in Maranao society that can claim to be pure Phagawid or Phagawidan. The most important thing about these categories is that both royal are included in the salsila from which they can trace their rights and obligations according to their status.